Derry City manager, Peter Hutton will plan for an FAI Cup semi-final tie against Bray Wanderers should his side defeat Cork City tonight at Turner's Cross. 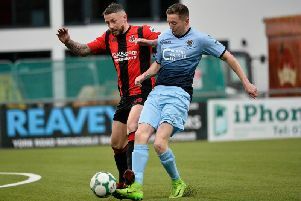 DERRY CITY have been handed an away FAI Cup semi-final tie against Bray Wanderers should they manage to get past Cork City in tonight’s quarter-final replay at Turner’s Cross. And that certainly won’t be an easy task against John Caulfield’s men who fought back to earn a 1-1 draw at Brandywell Stadium last Friday night. Peter Hutton insists his side must ‘do it the hard way’ if they are to progress to the last four for the third time in four years. The Derry boss welcomes back midfielder Philip Lowry from suspension for tonight’s tie, however, striker, Mark Quigley - who made his first start of the season against the Rebels on Friday - didn’t travel with the squad which left for Cork yesterday morning due to illness. In the other semi-final, Dundalk will host Longford Town. The last four ties to be played on the weekend of October 4th next. The draw took place today in the RTE studios this morning with Keith Fahey and Fran Gavin performing the draw.